Big shot Caleb. Nevada’s Caleb Martin went 2-of-10 from three-point range and looked like he was trying to draw contact on nearly every shot he took from deep in the second half. But he never stopped firing, and after the Wolf Pack went down by four on a four-point play from Kerwin Roach, Martin hit back-to-back threes to put his team in control for what would turn out to be for good. The NC State transfer is a 40 percent shooter from three-point range, so it is not surprising that coach Eric Musselman let him keep shooting. Still, for the senior guard to overcome a rough first 40 minutes is a big reason Nevada moves on to Round Two, and Martin’s recovery was symbolic of the entire team’s effort. After shooting only 39.3 percent in the first half, the Wolf Pack hit 51 percent of their second half shots on their way to scoring 61 combined points in the second half and overtime. Nevada overcomes an enormous day from Texas’s backcourt. Kerwin Roach and Matt Coleman, neither of whom has been particularly efficient from behind the arc this season, were great from deep today, combining to go 10-of-15 from three-point range while scoring 26 and 25 points, respectively. That type of output ordinarily would – and Shaka Smart would argue should have today – result in a Texas win. 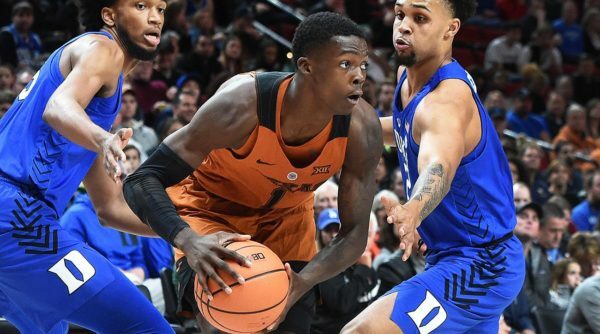 But Texas’ big men struggled to take advantage of a number of good looks inside, and the heroic efforts of Roach and Coleman were not enough to carry the Longhorns into the Second Round. Nevada’s balance and ball security was too much for Texas. The Wolf Pack had five players score in double figures, with Kendall Stephens leading the way with 22 points. Given that four of those players average double figures, their output was not surprising. That balance is what got Nevada to the Mountain West regular season championship. In addition, Nevada, which takes care of the ball better than any team in the country, did a fantastic job of doing that in what was a fast-paced second half. It offset the 42-34 rebounding advantage the Longhorns enjoyed in game. Friday Figures is a weekly feature where we look at some of the most intriguing statistics from the Big 12. This week, we’ll focus on the league as a whole, what losing Andrew Jones means for Texas and the breakout season of Iowa State‘s Nick Weiler-Babb. The Big 12 is as good as ever. Despite plenty of turnover last offseason, the league once again looks like by far the best — read: deepest — conference in college basketball. According to KenPom, a team expected to finish .500 in the Big 12 would have an adjusted efficiency margin of +18.14, a full two points higher than the next best league. 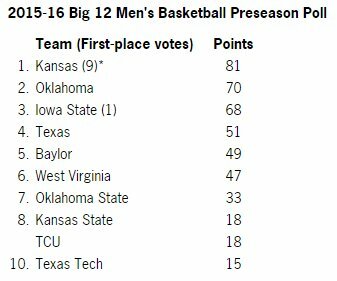 That mark would also be the third-highest margin for a conference in the KenPom era behind the 2003-04 ACC and last season’s Big 12. There are certainly valid criticisms of this year’s Big 12 centered around the Final Four potential at the top of the league, but there are also feasible arguments that every team in the league could be on the NCAA Tournament bubble this March if things fall their way. It appears that the fears of the Big 12’s demise were greatly exaggerated. Quick! 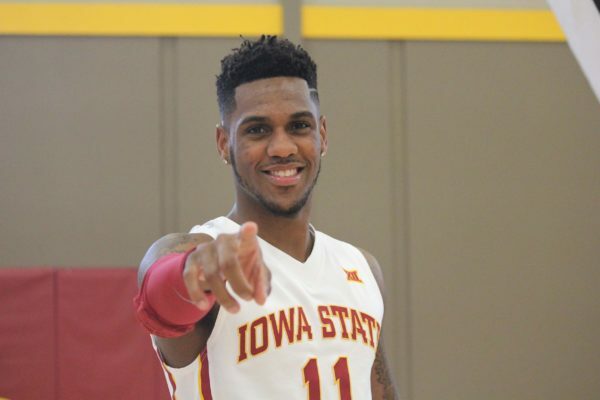 How many games has Iowa State won this season? You vaguely remember the Cyclones beating Kansas a few weeks ago, so that must mean they’re doing well, right? At this point in the year, you’re probably thinking they have a nice, healthy number of wins. Like 22 or 23. Yeah, that sounds good. You’ll go with that. I’m sorry, however, but you are incorrect. The correct answer is 19. Having 19 wins on February 27 isn’t particularly noteworthy unless you note how Iowa State got to that number in the first place. First, Steve Prohm put together an ambitious non-conference schedule that produced two losses to very good basketball teams (Gonzaga, Cincinnati) and two other losses that he’d like to have back (Iowa, Vanderbilt). Add in a 5-4 start to Big 12 play — not to mention Oklahoma State’s herculean turnaround — and it was pretty easy to forget the Cyclones even existed. Now they’re on a five-game winning streak and, with two more wins, have a chance to clinch the #2 seed in next month’s Big 12 Tournament. I didn’t think I’d be typing that sentence a month ago. Power Rankings time! We are now fewer than three weeks away from Selection Sunday and the committee has already had real conversations about which teams should be in, which teams should be out, where they should be seeded and where they will eat after the bracket is announced. The strength of each of the six power conferences is no doubt another topic the committee has discussed, which is why we need to have an honest talk with ourselves about where the Big 12 currently sits. The league has something of a body image problem. One year ago, the Big 12 was in the best shape of its life. It actually looked forward to leg day, but it’s been a different story ever since. Needless to say the league gained a few pounds during the holidays — just enough to notice it cannot fit into its favorite clothes anymore and needs to find a few good pairs of sweatpants. That’s all it is. Because the ACC is the best game going in 2017. The Big 12 is a little puffier in the midsection and its legs are hardly recognizable. But it’s great that we were able to talk this out. The power rankings are up next. There wasn’t any question what the college basketball world thought about Oklahoma a season ago. The Sooners were led by a likable All-American who was surrounded by a group of teammates that had played more than 100 consecutive games together. Even after a blowout Final Four loss to Villanova ended their season, conventional wisdom was that one poor performance wouldn’t diminish the tremendous gains and relentlessly bright future the program had ahead of it. Unfortunately, this season has made last year feel like the tail end of the Jeff Capel era. 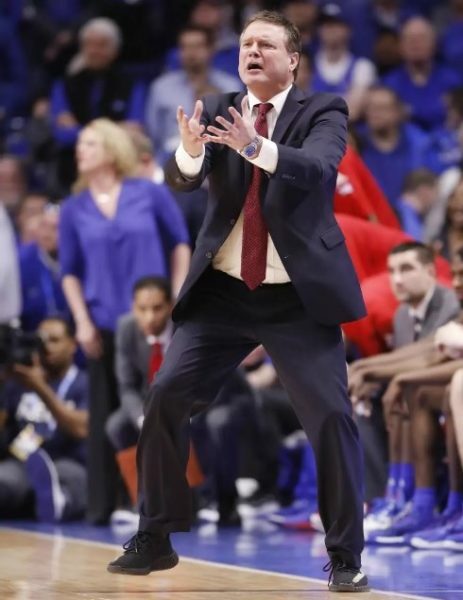 The returnees and freshmen have failed to mesh in any meaningful way, resulting in two seven-game losing streaks and looking like a finish in the Big 12 cellar is imminent. 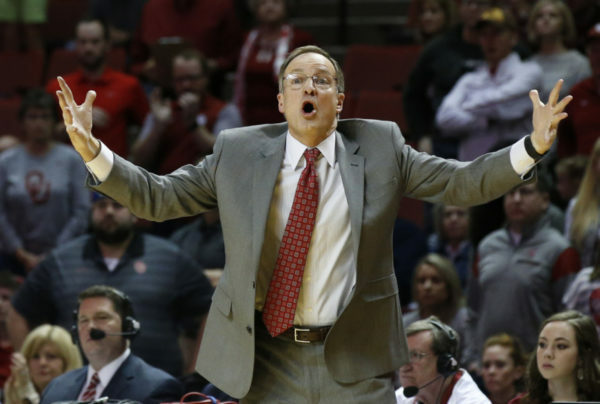 With leading scorer Jordan Woodard out for the rest of the season with a career-ending ACL injury, what seemed like an achievable 600 win threshold for Lon Kruger this season is increasingly looking like an impossibility. One bad season among several very good ones will not tarnish Oklahoma basketball in the long run, but it represents a reminder to those on the outside that no one is immune to a bad year every once in a while. This week’s power rankings are right after this goofy picture of Kruger. It took five weeks to get there, but the Big 12 finally returned to the wackiness that made it college basketball’s most entertaining league a season ago. At least for a day. 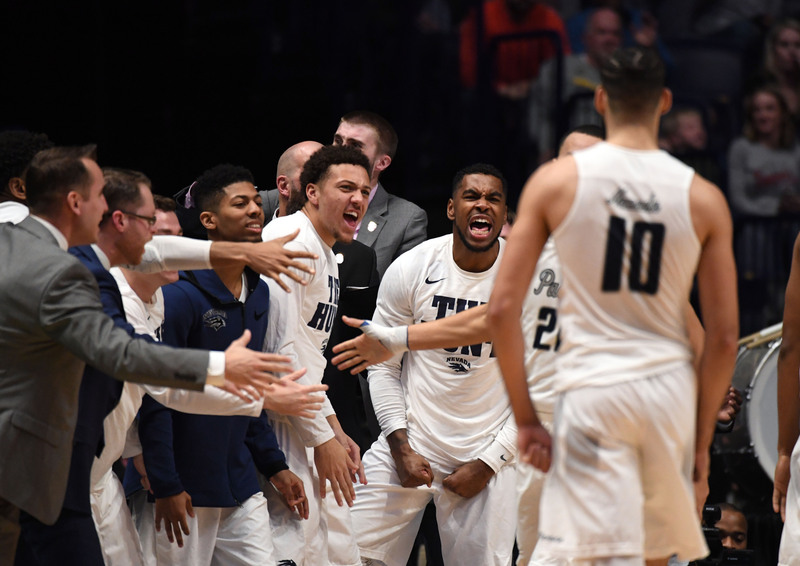 All three of Saturday’s upsets encompassed a group of strangely similar qualities: the losing teams were ranked in the top 10; they dropped these games on their home floors; and the teams who won desperately needed to bolster their otherwise tame NCAA Tournament profiles. 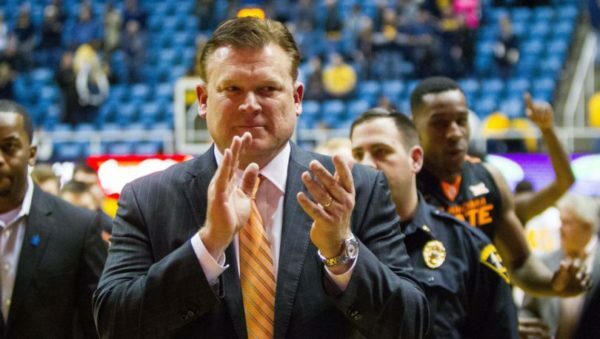 On the backs of the still surging Jeffrey Carroll and superhero guard Jawun Evans, Oklahoma State became the second Oklahoma school to hand West Virginia a home loss this season. 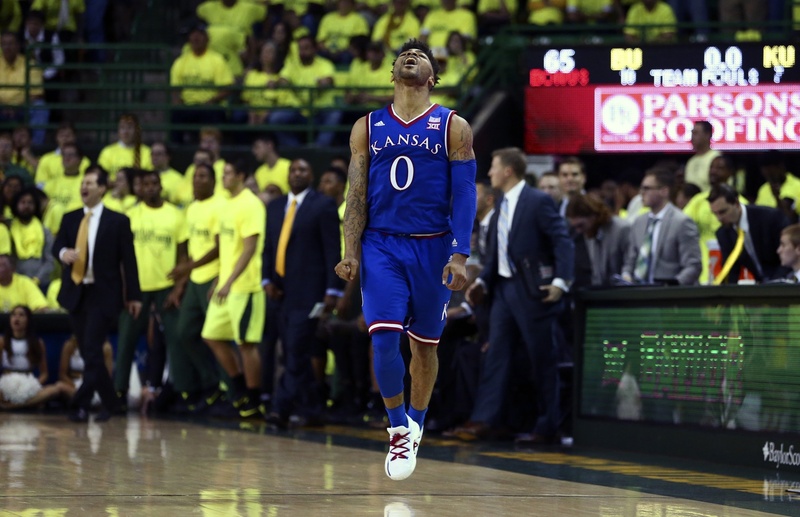 Known for their insane comeback victories, Baylor was unable to overcome Kansas State’s 19-point first half lead, even in Waco. Finally, the Big 12’s best match-up gave us another game to remember. If you’ve enjoyed the previous editions of Iowa State–Kansas since 2013, there is a great chance you also liked the Cyclones’ thrilling overtime victory in Allen Fieldhouse. What Saturday’s action proved is that a day, or even a week, full of surprises is still possible in the less chaotic 2017 version of the Big 12. Our rankings are coming your way. Last season was like a dream for the Big 12, as junior and senior-laden teams produced some of the best basketball the conference has seen in its 20-year history. Seven teams made the NCAA Tournament, and unlike years past, multiple members other than Kansas made it to the second weekend and beyond. With much of that experience from those teams now gone, many Big 12 teams are looking to their freshmen to lead this season. There are a few schools with freshmen who did not make the cut for several reasons. Those particular teams either did not have compelling enough freshmen just yet (i.e., Baylor and West Virginia), have good contributors who haven’t played in every game (i.e., Iowa State’s Solomon Young) or don’t have any scholarship freshmen at all (Texas Tech). Let’s take a look at the top eight freshmen in the league to this point in the season. Jarrett Allen, center, Texas (10.5 PPG, 7.8 RPG, 1.3 BPG in 29.7 MPG): Allen being on this list is both a blessing and a curse. The Round Rock, Texas, native currently ranks first in rebounds and blocked shots on the team and is third in scoring. However, Allen has to this point logged better field goal shooting (52.2%) than he has at the charity stripe (51.7%). Still, the season is young and this freshman is a rising star for the Longhorns. 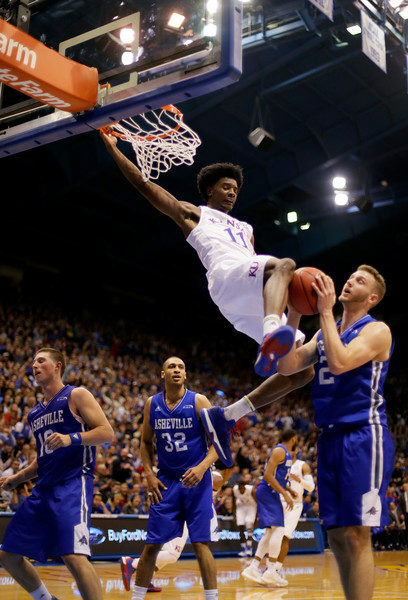 Udoka Azubuike, center, Kansas (5.0 PPG, 5.0 RPG, 1.3 BPG in 13.7 MPG): Azubuike is the latest in Bill Self’s successful recruit-17-year-old-basketball-prodigies program. His measurements — an energetic 6’11” big man with a 7’5″ wingspan — are what get NBA scouts excited, but it is clear that the freshman has some game. Self clearly is buying in, given that Azubuike has started each of Kansas’ last two games. Prepare for more impressive numbers from this precocious big man after we ring in the New Year. One Burning Question: Who Will Run Point For Shaka Smart? Last year’s Texas team was, more or less, the end of an era — the Rick Barnes Era. The Longhorns’ season ended on an incredible half-court heave from Northern Iowa in the NCAA Tournament, and 80 percent of Texas’ starting lineup on that day were made up of seniors. The other player, junior Isaiah Taylor, decided three weeks later that he would forgo his remaining year of eligibility and enter the NBA Draft. With Taylor gone, the two remaining scholarship players from the Barnes era are senior forward Shaq Cleare and junior guard Kendal Yancy. Taylor’s was the most painful departure of all, as he led the team in scoring (15.0 PPG), assists (5.0 APG) and games (33) last season. While it’s true that the Longhorns have an entire starting lineup to replace, head coach Shaka Smart‘s biggest concern is who he will direct to manage his offense on opening night. All we know right now is that it will be someone young who will have to learn the position on the fly. Election Day is almost here. In this vein, it appears that Smart is leaning in a particular direction but we may not have all precincts reporting just yet. 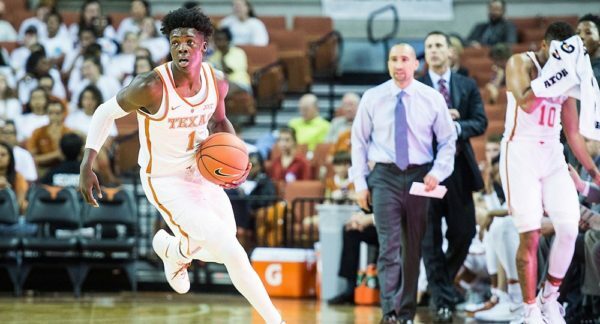 Down three scholarship players in the Longhorns’ exhibition win last night, Smart started 6’4″ freshman Andrew Jones and he played well against a vastly inferior opponent. The Irving, Texas, native did what led to his meteoric rise at the tail end of his high school career — a little bit of everything. He scored 17 points, grabbed seven rebounds, dished five assists and, most importantly, turned the ball over only once in 33 minutes of game action. Whether he’s facing D-II competition or the powers in the Big 12, Jones should have a good size advantage at the point guard position that makes him especially difficult for defenses to both contain and cut off his passing angles. It is practically March, isn’t it? We’re just four days away. You can almost feel the bubble shrink as at-large hopefuls drop games they shouldn’t be dropping and simultaneously expand whenever a recent winning streak is validated with a big win. As of now, the Big 12’s bubble situation is relatively clear. Barring a flurry of wins from Kansas State within the next two weeks, the conference will send seven teams to the NCAA Tournament. The last team among the seven is Texas Tech. When Big 12 coaches picked them to finish 10th a few months ago, how could anyone have seen this coming? Texas Tech has eight conference wins at this point which bodes well with how the selection committee has historically treated eight-win Big 12 teams. Oklahoma State (twice) and Texas (once) made it safely into the field of 68 with that number in 2014 and 2015. Much has been written about the Red Raiders’ rise from rotten to respectable, and rightly so, but we shouldn’t forget that they’ve gone on this five-game winning streak without the services of starting center Norense Odiase. Tubby Smith is the favorite for Big 12 Coach of the Year and is also creeping into National Coach of the Year discussions as well. Now let’s hope all seven clubs make it to the Sweet Sixteen.